The mysterious Metamachy is finally revealed! Metamachy's name comes from a Greek root meaning "beyond the fight". It is a board game for 2 players using a 12x12 squares board. There are 60 (5x12) pieces of 12 different types: King, Queen, Eagle, Lion, Prince, Bishop, Knight, Camel, Rook, Cannon, Elephant and 12 Pawns. There is a choice of 12 different starting setups. Black chooses the setup and White makes the first move. Goal is checkmate the opposing King. King: moves 1 step in every (8) directions on a not attacked square. The King is in check if it is attacked by one or several ennemy pieces. 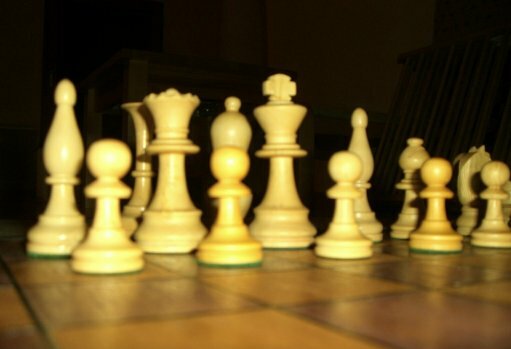 It is forbidden to play a move letting his King in check. At his first move, the King can make a 2-steps jump, horizontally, vertically, diagonally or like a Knight, providing that he is not in check and that the overpassed and the arrival squares are not under attack. The overpassed square may be free or occupied. Queen: slides to any square along the file, the rank or a diagonal on which it stands. Eagle: moves one square diagonally and then, slides away of an indefinite number of cases vertically or horizontally. It is authorized to go only one square diagonal. It can not jump and the unobstructed path must start with the diagonal movement. Lion: moves as a King (a single step move in any direction), or may jump to a position two squares away, jumping in any orthogonal or diagonal direction, or jumping as a Knight. Prince: a non-royal King who moves and captures one square in any direction, but without being hindered by check. Like the Pawn, he can also move without capturing to the second square straight ahead. When he reaches the last row it promotes to one of the three major pieces: Queen, Lion or Eagle. Bishop: slides to any square along a diagonal on which it stands. Note that it always stays on the same color of square. Knight: jumps to the opposite case of a 2x3 rectangle. No matter what the intermediate case contains. Note that it always change the color of square at every move. Camel: jumps to the opposite case of a 2x4 rectangle, like an extended Knight. No matter what intermediate cases contain. Note that it always stays on the same color of square. Rook: moves to any square along the file or the rank on which it stands. Cannon: moves without taking like a Rook, but it takes by going in a straight horizontal and vertical line and jumping over exactly one piece. When a Cannon takes a piece, there must be exactly one piece between the original and final square of the Cannon's move - this piece may be of either color. Elephant: moves one or two squares diagonally. When an Elephant moves two squares, no matter what intermediate cases contain. Note that it always stays on the same color of square. 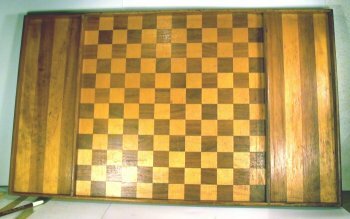 Pawn: can move straight forward one or two square from any position on the board, without capturing. It captures one square diagonally forward. As a consequence, the en-passant capture is possible every time an opposite Pawn or Prince has advanced two squares. When he reaches the last row it promotes to one of the three major pieces: Queen, Lion or Eagle. At the beginning all pieces but the Kings, Queens, Eagles and Lions are placed. Then, Black freely decides where to place his King, Queen, Eagle and Lion on squares f1, g1, f2 and g2. Then, White put his pieces symetrically in mirror (if Black King is on f1, White King goes on f12) and makes the first move. This agreement balances the advantage of White starting to play with Black choosing the setup. Then, the Queen has a choice of 3 positions: beside the King, beneath the King or diagonal to the King. Then, the Eagle has a choice of 2 remaining positions. Then, the left place is for the Lion. 2x3x2 = 12. You can play Metamachy if you own Zillions-of-Games. Read the very first book about this great game! The book contains all rules, illustrated with many diagrams, a lot of technical considerations and some annoted games. It also reveals the incredible history and genesis of Metamachy. 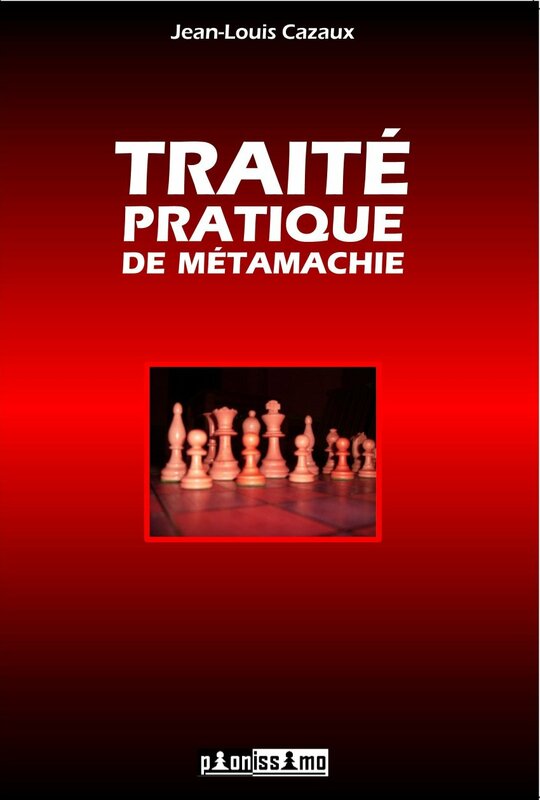 The book is in French, but with many diagrams it is a must have also for English readers. Un tablier de 12 x 12 cases. Roi, Dame, Fous, Cavaliers, Tours, Pions mais aussi Aigle, Lion, Chameaux, Éléphants, Princes et Canons. 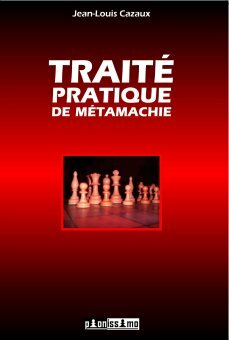 12 manières différentes de les disposer au départ !